Given the fields of interest the journal hopes to address (also from the website: “Fields of interest include, but are not limited to: Corporate Learning Trends; Using Web 2.0 Tools for Learning and Collaboration; Informal and Uninformal [sic] Learning; Skills for Work and Learning; E-Learning Design and Usability; Strategies for Implementing E-Learning; Mobile Learning; Lifelong Learning; Enterprise Learning; Corporate Universities; Professional Education Programmes; Learning on the Job; On-Demand Learning; Connecting Personal Learning Goals and Objectives with Corporate Learning; Corporate Strategies for Encouraging/developing Individuals as Learners; Managing Culture; Change, Adoption of Wiki, Blog, and Other Social Technologies; Online Training Methodologies (simulations, case-based learning and the like); Performance support systems; Knowledge Management; Semantic Web; MashUp Technologies; Platforms and Content Authoring; New Learning Models and Applications; Pedagogical and Psychological Issues; Social Networking; Internet Applications; Networked Tools; Language /Speech; Collaboration Tools / Collaborative Networks”), it sounds like this may be the only business education-oriented journal one will ever need. Let’s see. iJAC is completely free -- all one need do to become a regular reader of the journal is to register on the system, which has the added advantage of giving you access to all the open access journals available through Online-Journals.org. iJAC uses Stanford’s LOCKSS system for permanent archiving, and it is indexed in the DBLP Computer Science Bibliography, the Directory of Open Access Journals, EBSCOhost Business Source Complete, EBSCOhost Business Source Complete: Government Edition, EBSCOhost Business Source Corporate Plus, Google Scholar, INSPEC, Microsoft Academic Search, and Ulrich's. This is a pretty impressive list of indexers, and adds to the journal’s credibility, as does its international editorial team, which comes from Australia, Austria, Belgium, France, Germany, Italy, the Russian Federation, Sweden, the United Kingdom, and from the United States. The review process for all manuscripts is “refereed in a double-blind review process by at least two international reviewers with expertise in the relevant subject area” (and that applies to all sections of the journal, including Papers, Short Papers, Special Focus Papers, Reports, Application Notes, and Calls). Since content is what’s all important, let’s see how iJAC does there. The most recent issue at this writing includes a guest editorial by David Guralnick (Chair of the International Conference on E-Learning in the Workplace), an announcement of the 2012 Winners of the International E-Learning Awards in the Business and Industry Division, eight Special Focus Papers (“ELabMate: A Tool for Delivering Programming Courses Effectively,” “E-Learning and Comprehensive School and Kindergarten Development,” “Adding Social Media to e-Learning in the Workplace: Instilling Interactive Learning Culture,” “Staying Relevant and Current with Online Learning in an Increasingly Global and Competitive Environment,” “Training Virtually Virtual,” “E-Learning as a Core Component of the Instructional Design Profession,” “Manage Projects Smarter: Picking Tools for Small and Medium-Sized Enterprises,” and “Using Communities of Practice for the Learning of Students with Poor Vision”), two Application Notes (“Choosing a Virtual World Platform for Teaching: “VICERO” - A Scoring Model Aiding the Right Choice” and “From Cherry Picking to Convergence – Migrating E-Learning Delivery to an LMS [Learning Management System] – the COLeLIO Experience”), and two Calls for Papers (for the Enterprise Learning - Conference & Expo [ELCE12] and for the International Workshop Cloud Education Environments). Papers in previous issues include: “Successful Integration of Informal Learning in Engineering Education,” “The Learning Continuum: formal and informal learning experiences – enabling learning and creation of new knowledge in an organization,” “An Approach to Foster Engineering Skills at Graduation Level: Meeting the Industry Needs,” “E-Learning Readiness in Organizations,” “E-Government Between Developed and Developing Countries,” “Mood Inference Machine: Framework to Infer Affective Phenomena in ROODA Virtual Learning Environment,” “How can Socratian Methods facilitate e-learning in the Business Environment?” and “Modeling and Simulation of Relocation of a Production in SIMPRO-Q Web Based Educational Environment.” Hmmm. Seems like a journal about corporate e-learning. Articles here are quite accessible and readable – and most important – practical. Since content comes from around the world, it’s possible for the reader to benefit from global practices, and to build on the work and techniques of an international corporate community. Given the increasingly global economy, it’s a boon to have such a diverse set of experiences offered, and in such readily-applicable fashion. 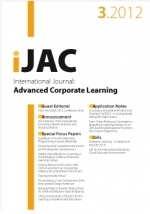 Ultimately, I have only one cavil about this journal: if it wants to reach its readership, it should be called the International Journal of Advanced Corporate e-Learning. This is a title all librarians will want to know about, as will your researchers.